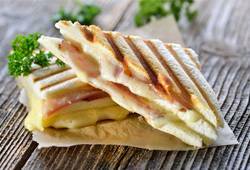 The KuKoo Panini Press is an essential appliance to any and all sandwich artists. The double-ribbed, scratch-resistant grills afford professional-quality sandwiches to ensure your food is more appealing than ever. Don’t just stop at sandwiches and paninis, though… The KuKoo Panini Press is ideal for grilling toasties, burgers, and even vegetables—you’ll simply love the multi functionality of this, a culinary essential!